What’s the difference you ask ? The TimeMachines TM1000A GPS NTP Network Time Server is a simple to use GPS based time server that supplies accurate time for all computers and time keeping devices on the network. By placing a time server on the local network, (S)NTP time packets are provided without requiring systems to go to the Internet to get a Stratum 1 time synchronization. The TM1000A system uses an active GPS antenna to maintain the current time as broadcast by GPS satellites. 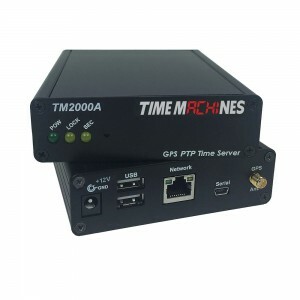 The TimeMachines TM2000A GPS NTP+PTP Network Time Server represents a major step forward in capabilities at a breakthrough price point. It will supply accurate time for all computers and time keeping devices on the network. Supporting both Precision Time Protocol (PTP) and Network Time Protocol (NTP), a Stratum 1 time source can now be available on the local network with no need for an internet connection. The TM2000A system uses an active GPS antenna to maintain the current time as broadcast by United States GPS satellites planet wide. In addition, a high stability OCXO reference clock is included that allows the unit to serve time if GPS lock is lost for periods of time. Until now, a PTP capable time server started with at $5000 and went up from there. The TM2000A provides both Multicast and Unicast PTP protocols to up to 50+ devices. Its high precision OCXO reference clock allows for several hours of GPS signal loss. Holdover time: PTP: 2+ hrs NTP: 24+ hrs or better than 0.1 seconds over a year. ** Outdoor antennas are available from TimeMachines including custom length cables and accessories, maximum cable extension is limited to 100 feet / 30 metres without requirement to update to a powered GPS antenna/receiver.